When can I buy one?!?! This thing is so close to what I want. Would be slightly more into just a WoP with a dindindin footswitch (think they made one like that, which I'll never see again ); this is a bit much for me. But still a really cool take on their pitch shifter! The fuzz circuit is so cool. Its own foul beast in the best possible way. I have money burning a hole in my pocket that is just waiting for this pedal to be released! It sounds so damned awesome! That clip with Juan Alderete playing it is just bonkers. Love the ”side clipping”. I keep watching demos of this thing and thinking I need to trade in my old Wizard. I've made my dreams a reality. I approve of your dream. I think you're going to have to tell us what's going on here. 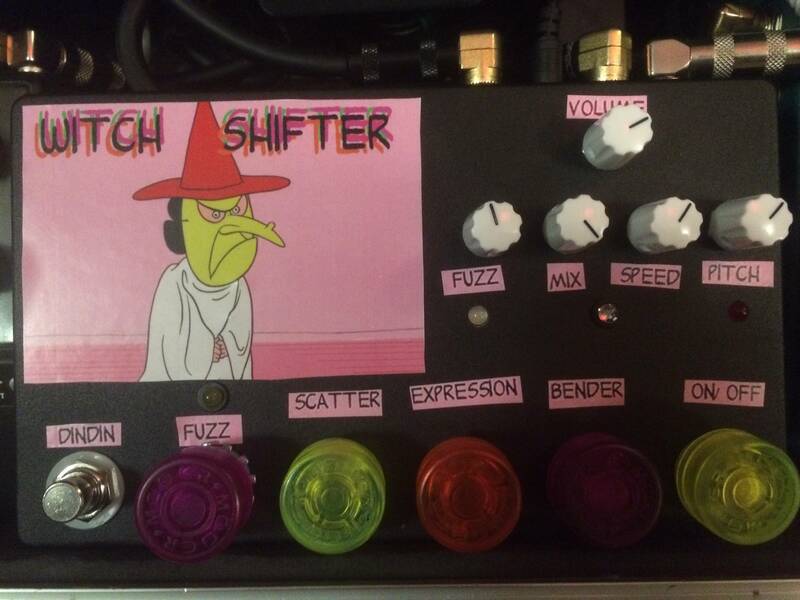 The Witch Shifter now has footswitches for all three toggles as well as a footswitch that 'activates' the fuzz (returns the fuzz value to 0 when off) for Witch Shifting holidays. That's pretty great. Do you get any volume jump with the fuzz active? Too bad you can't top mount those secret delay controls. The fuzz pot is really just a volume for the fuzz so it can be a volume cut I believe (but more often than not a boost). The secret menu is nice but there are so many wild things happening that adding a delay is not my main focus with the Witch Shifter. I feel like throwing delays before and after it alleviates that need to go rummaging in the secondary controls. Why is the enclosure so tall? b) Does it have something to do with the metal prongs that come an inch and a half off the board? What are those for?